We’ve all been there, whether we’re studying for an exam, creating a presentation, or brainstorming for a big project: Gradually our minds become stuck circling around a single thought, or they begin wandering off entirely, into unrelated territory. Clearly it’s time for a getaway. Of course, some real travel to the Alps or the Caribbean would be nice (as we wrote about in Part I of this series), but Saylor is actually referring to less drastic methods of getting away—without leaving the building. 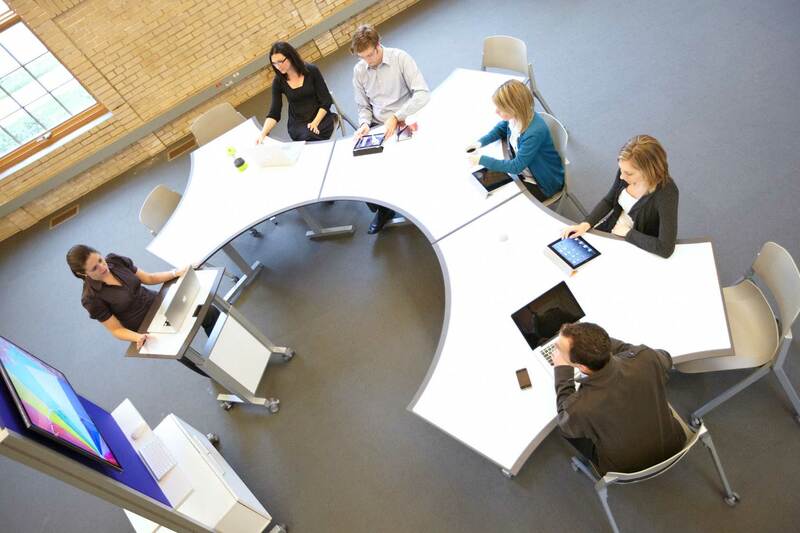 “A variety of inspired destinations in the workplace naturally encourages movement, and that contributes to a healthier, more social and more productive work environment,” explains Rick Glasser, Vice President of Marketing and Product Management for izzy+. 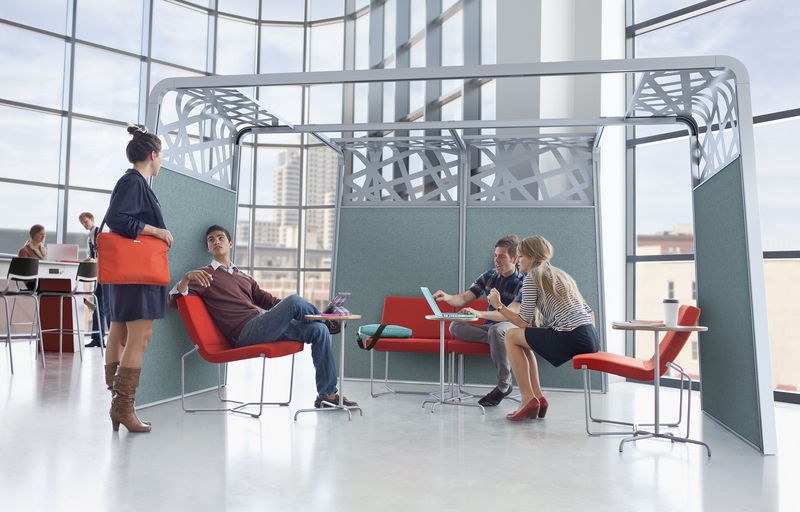 The Nemo Trellis embodies the idea of inspired destinations—places that make you want to get up and head for a change of scene, whether to have a casual meeting or refresh your sense of focus. 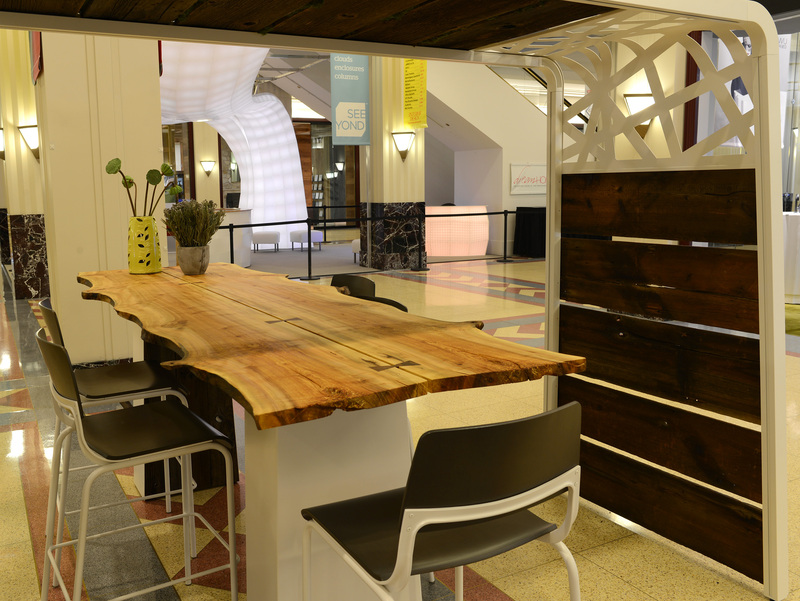 Of the three Nemo Trellis installations in this year’s showroom, two (pictured below) are concept designs created by young designers who won the izzy+ design challenge that was introduced as part of the Valentine’s Day promotion. 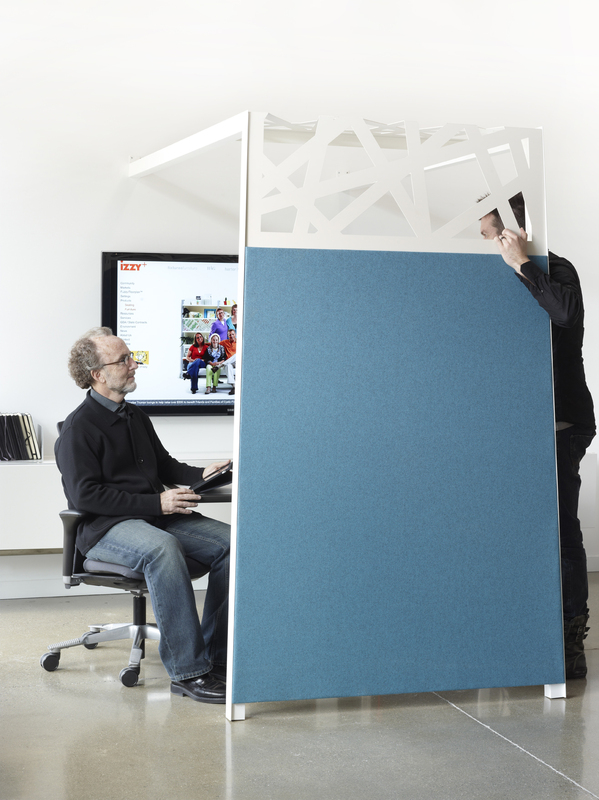 Lindsey Salazar of Archideas in Chicago created a Trellis that blurs the boundaries between outdoor and indoor environments, while Eda Muco of Dyer Brown & Associates in Boston used a translucent material to play with the idea of boundaries without walls. Another, more whimsical Nemo Bar and Trellis concept (pictured at the top of this post) is installed in the Merchandise Mart lobby, where weary NeoCon guests can take a few moments to sit down and refresh. This interpretation of the Trellis has a wheatgrass roof and reclaimed barnwood panels, while a massive cross-section of polished maple serves as the Bar’s surface. 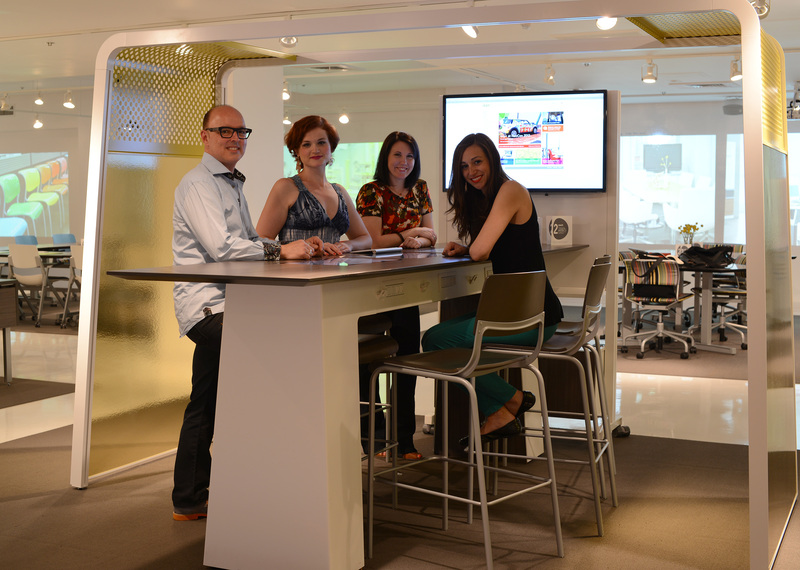 Above: izzy+ sales reps and the Nemo Trellis design contest winners, beneath the Trellis concept created by Eda Muco (from left to right Marty Smith and Eda Muco of Boston, and Melissa Huff and Lindsey Salazar of Chicago). 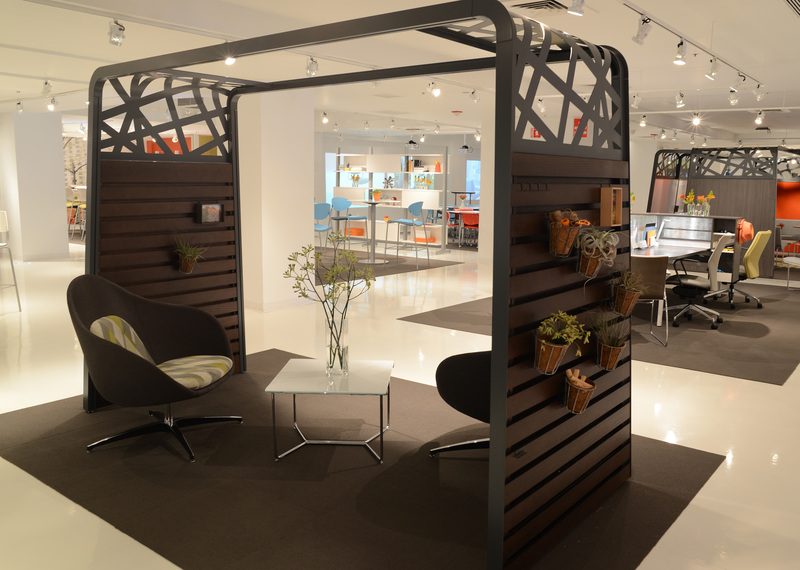 Below: The Nemo Trellis concept designed by Lindsey Salazar, creating a cozy cove for the newest version of the Lotus concept chair by Chuck Saylor. It’s summer—the time of year most synonymous with travel. As soon as the weather begins warming up, we start feeling that itch to get away. 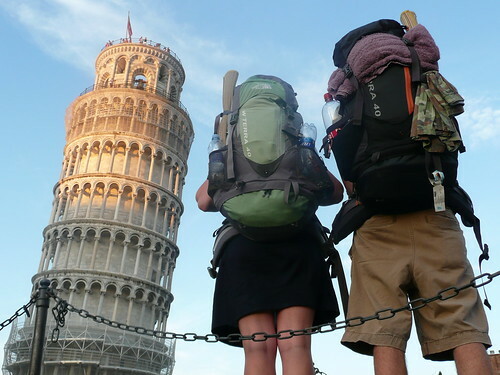 Travel is something most of us crave so much that we set aside precious time and money for it, and we often enjoy the planning and anticipation almost as much as journey itself. There are obvious, almost universal benefits of travel, like the freedom of leaving our inbox, yard work, and the daily grind behind. Other benefits are more personal, depending on whether we’re seeking relaxation or adventure, natural beauty or urban stimulation, a complete change of scene or a chance to revisit a family tradition. But no matter what kind of getaway you prefer, scientists confirm what people have innately known for hundreds of years: The psychological benefits of setting out for a new destination are multiple and impactful. In fact, “getting away” is essential to effective thinking—it actually opens up neuropathways in the brain, because it puts distance between us and all the problems that feel “close” when we’re at work and home. Yep. The first benefit of travel, according to Boyes, is that “Geographic distance leads to improved problem solving” that’s “more creative and expansive.” Brandon Reame, Market Development Strategist at izzy+, has seen that happen first hand—not just as a result of his own travels, but also when he led a group of interior designers on an izzy+ trip to Nicaragua last fall. Joy Eling, izzy+ Product and Brand Manager, agrees: Travel is inspiring—even when it’s just a family vacation to the beach. In the “5 Reason Why Travel is Good for You” article, Boyes shares four other key benefits of travel: being more open to new experiences, which builds new skills to take home with us; developing a more expanded sense of self and what we’re capable of; being able to fully relax (a given benefit! ); and returning home with more curiosity and a broader sense of meaning in life. Reame adds another benefit: Travel impacts how we see others, which in turn impacts our ability to be Better Together. While all those benefits of travel sound wonderful, the reality is that we have to stay home and take care of business before we can afford the time and money travel requires. So does that mean our problem-solving, creativity, and relationships are destined to remain stuck when we’re stuck in the office? 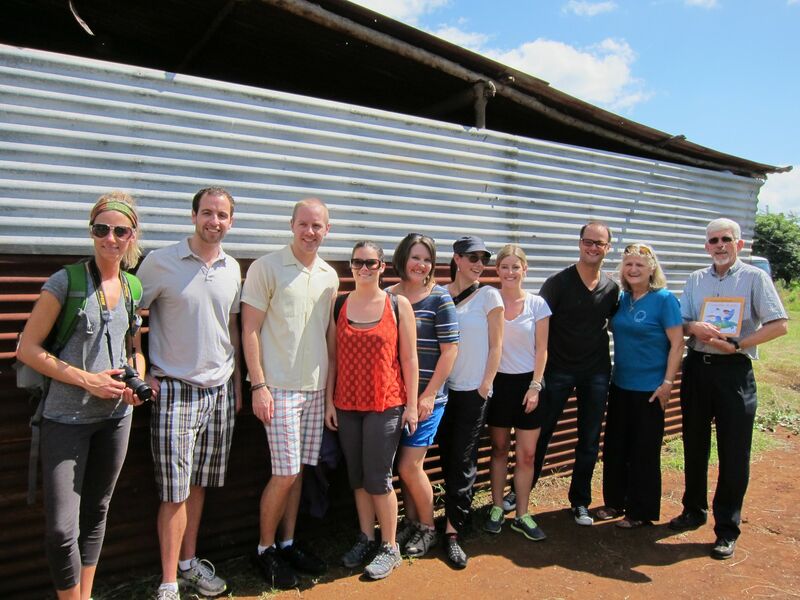 The group of designers that traveled to Nicaragua with izzy+ in November 2012. “Inspiration”—it’s one of those words most of us are drawn to but can’t easily define. Of course, if you look up the word in a dictionary or on the Internet, you will find definitions, but they might prompt more questions than answers. For instance, is inspiration rooted internally or externally? Is it a pull or a push? Can you impact inspiration, or only be open and wait for it? 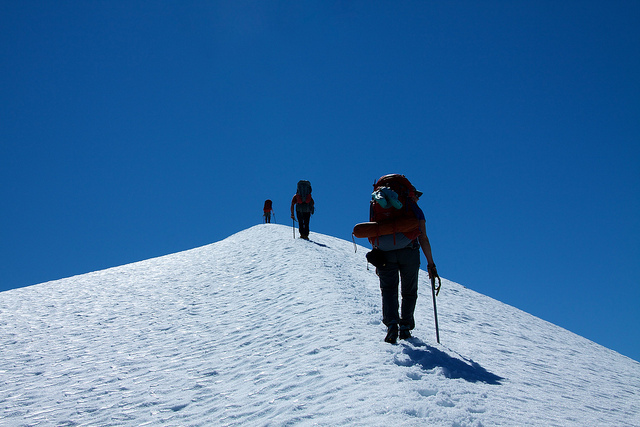 And does inspiration work the same way for all of us, or is it an individualized experience? Dictionaries don’t answer these questions, yet somehow when we encounter inspiration we know it—without a doubt. And the effects of being inspired seem mostly universal: Our minds start buzzing, energy levels spike, and time seems to stand still. We’re able to be more creative, more productive, and more focused. In other words, the feeling is great, and so is the outcome. We’d all love to be under inspiration’s magic spell every day. So what can we do to get more of it? An informal survey around the izzy+ office and on Twitter revealed two factors that seem to consistently impact how inspired we are: people and places. 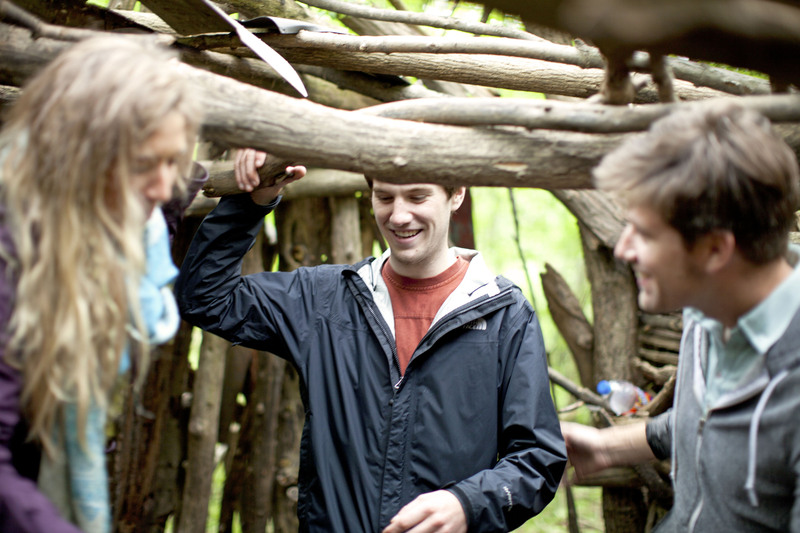 Our interactions with others, and the spaces we live, work and relax in, play important roles in how inspired we are. Since all our interactions with others happen in spaces (and since we at izzy+ happen know a thing or two about spaces), it seems safe to boil it down to this truth: Our environments play an important role in inspiration. Just think about the spaces you gravitated to as a child: A nook under the stairs, a window seat in an alcove, a fort in the branches of a tree. As adults, we might have a favorite table at a coffee shop, a chair on a porch, or a bar in the kitchen where everyone seems to gather at every party. Each favorite space may be somewhat unique to us, but the characteristics often overlap: People are drawn to spaces that are cozy, intriguing, out of the ordinary and fresh, yet familiar. 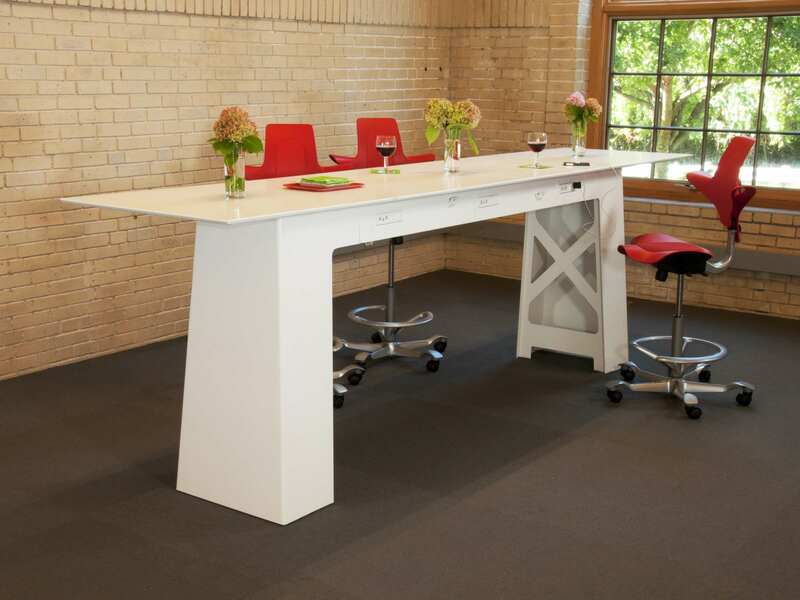 We want alternatives to our typical office-and-desk settings. 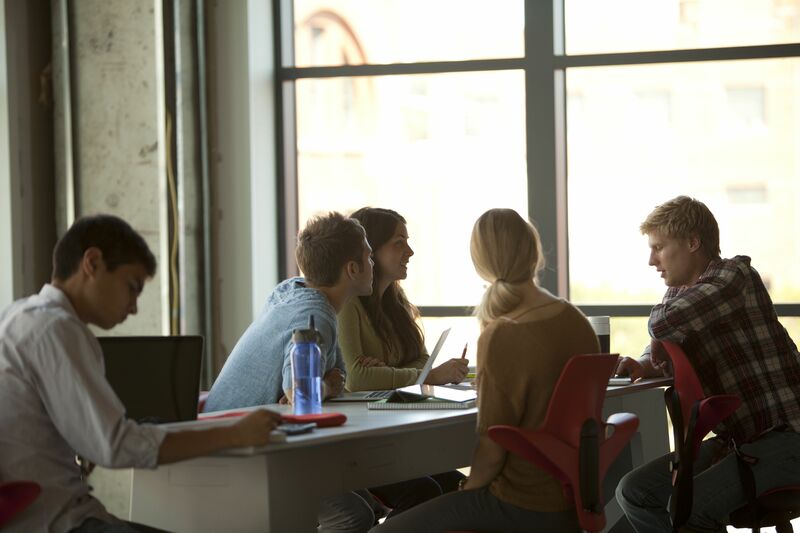 Today’s workers and learners clearly want spaces that go beyond utilitarian purposes. That favorite childhood space definitely played a role in inspiring the idea of the Nemo Trellis, Saylor says. What spaces inspire you? What design elements make spaces more inspiring? We love hearing what YOU think! Be sure to visit our Valentine’s mini-site to hear more stories about what inspires izzy+ designers, to find out more about the Nemo Bar & Trellis, and to enter our Trellis design competition. There’s also information about registering to win gift cards or a giving-back adventure to Nicaragua. 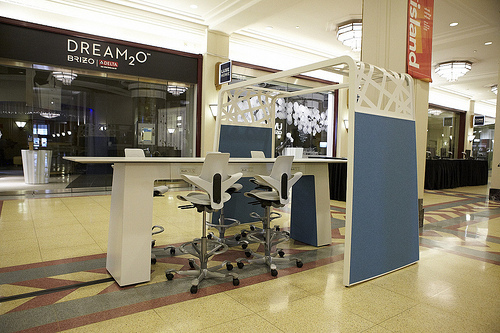 The Nemo Bar and Trellis set up as a recharge/refresh station on the first floor of the Merchandise Mart at NeoCon 2012. A college dropout, the founder of Apple changed our world in so many significant ways, reminding us that we have the potential to make a difference in the world, and to inspire others. How can we not be inspired by that truth? But inspiration without diligence is ineffective. I remember being in Palo Alto on a visit in the late 1970s when I first ran into Steve Jobs’ incredible group of young, creative entrepreneurs who were striving to change the way we all communicated with each other. Their intellectual curiosity and personal drive were amazing, but it would take the next decade for the vision to become reality. When I learned about Jobs’ death on October 5, 2011, I was reminded that inspiration is an historical event. To do inspiring things takes something special that too often we forget about—it takes diligence, perseverance and a lot of hard work. These are powerful attitudes capable of bridging the past and the future, and this is the perfect season to be reflecting on their importance in our work and lives. As izzy+ looks ahead to 2012, we are both excited and grateful. Our excitement is rooted in continuing our exploration of concept projects like Nemo—design ideas that are truly founded upon human-centered needs and behavior. And our gratitude is rooted in relationships and connections with people like you. You inspire us and motivate us to remain diligent in our work toward better working and learning environments. Let’s all work together in 2012 to make our world a better place. Have a happy—and inspiring—New Year.